Happy November! I’ve really gotten into the swing of Christmas baking (albeit a smidgen early I know), and after about 7 batches of recipe experimentation I’m ready to share the perfect, keep-its-shape, slightly crispy, peanut buttery goodness cut-out cookie recipe. 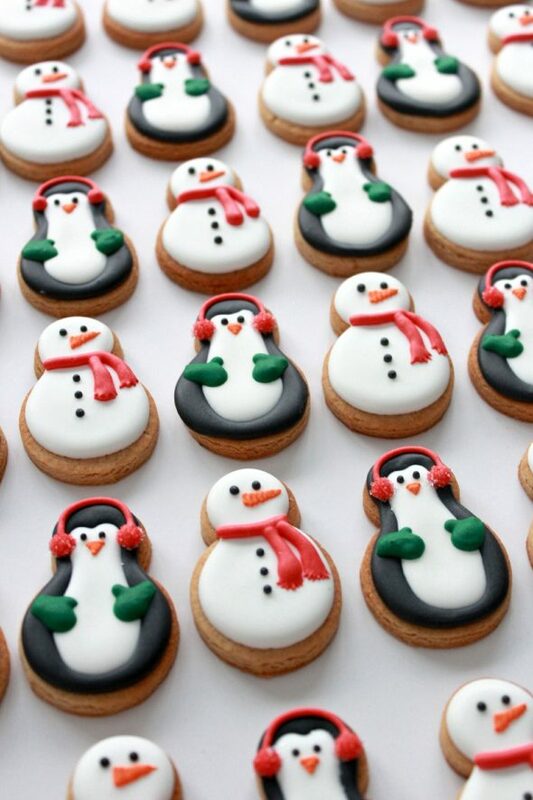 Chocolate royal icing on top would bring these cookies to another whole level don’t you think? 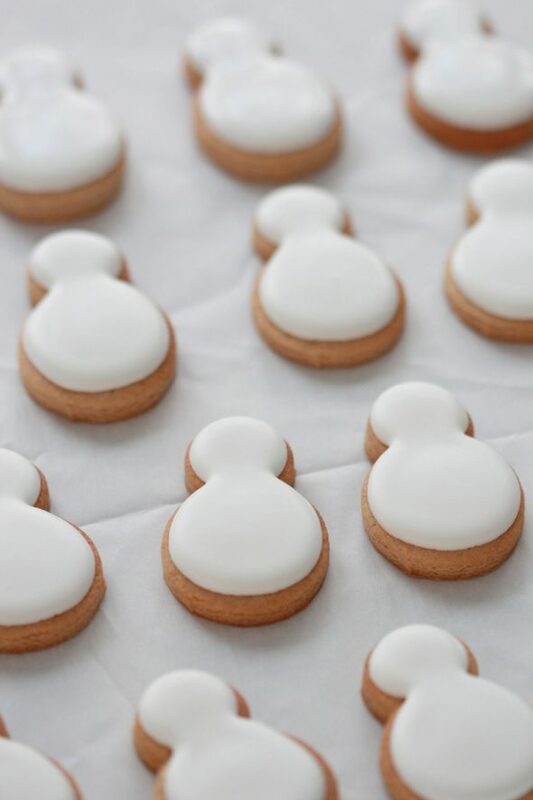 I will be sharing my recipe with you soon (it needs a little more tweaking), and my go-to royal icing recipe was perfect for the white snowmen I had a hankering to make. 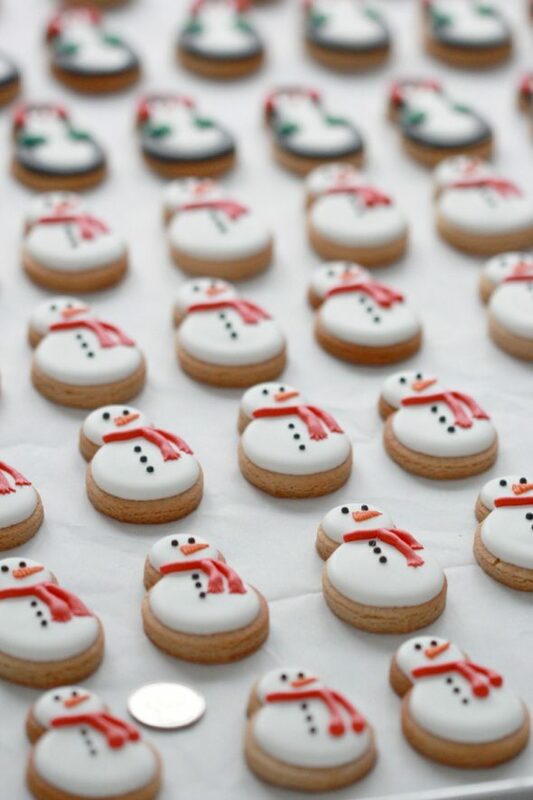 The key to these cookies keeping their shape lies not only in the combination of ingredients (exact measurement in baking is important) and omission of the leavening agent (i.e. baking powder), but in some crucial points in the process. You can find a whole post dedicated to cookies keeping their shape here, but I’ll share a quick summary with you as well. Use the best quality butter you can find (unfortunately usually the most expensive). Higher quality butter has less water content, and therefore spreads less during baking. When creaming your butter and sugars, mix only until just incorporated. Traditionally, creaming the butter and sugar means whipping it until it becomes light and fluffy, but doing this will incorporate too much air for this cut-out cookie… perfect for cakes and cupcakes though. 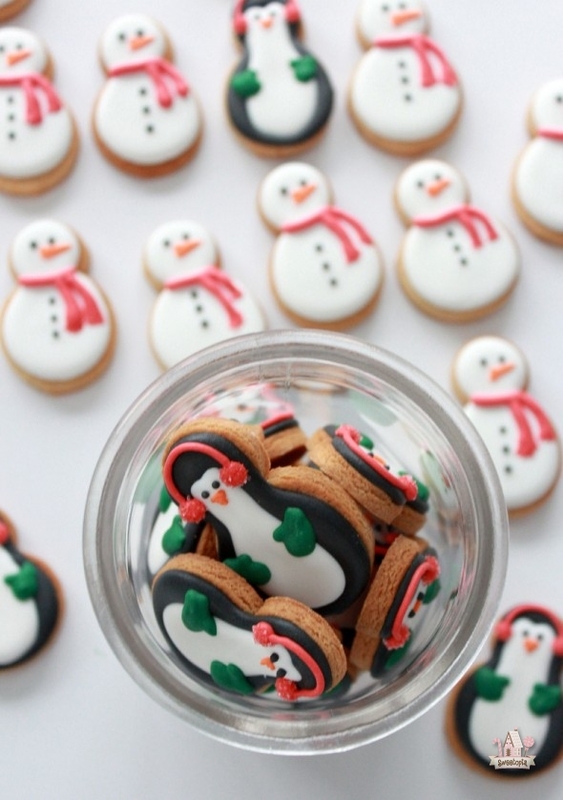 Also chill your cookie shapes to almost the frozen point (even frozen works if you have the time) before baking. Taste-wise, my favorite peanut butter, and the one I love with this recipe, is definitely SKIPPY peanut butter. I used the SKIPPY Smooth brand for these ones, but have also used the Natural – either is delicious. Although this post is sponsored by SKIPPY Peanut Butter, all opinions are my own. 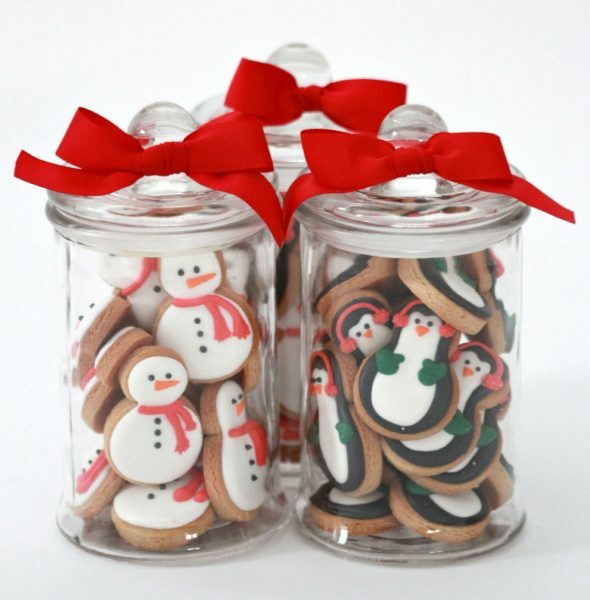 Pop these bite-sized cookies into your mouth into these jars and share as a sweet holiday treat! Of course the size of cookies you make will depend on what jar you put them in, but about 12 of these cookies fit snugly into each of these 16 oz jars. 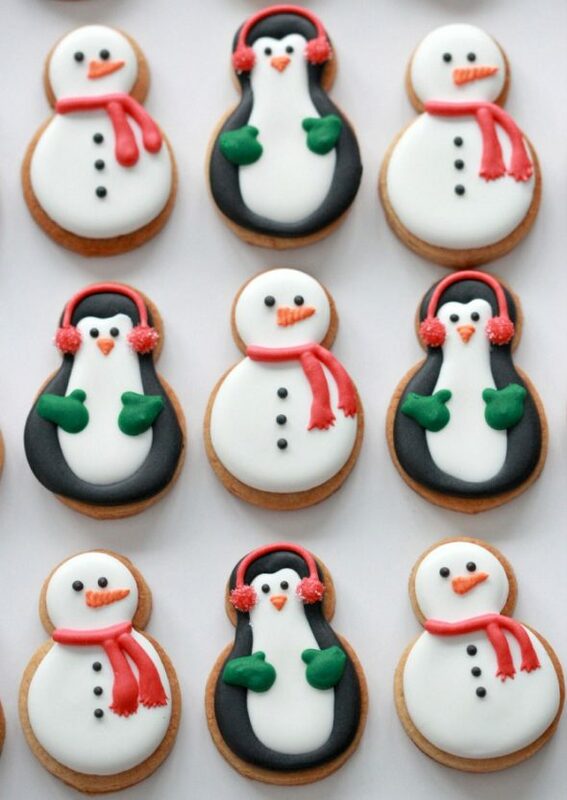 As for the snowmen and penguin cookie shapes themselves, I used two circle cutters to create a miniature snowman and penguin of sorts. The larger circle is approximately 1 inch (2.5 cm) in diameter and the smaller one, about 1/2 an inch (1.3 cm) in diameter. For every color of icing except for the scarf, I used a #1.5 piping tip . For the scarf I used a #2.5 . 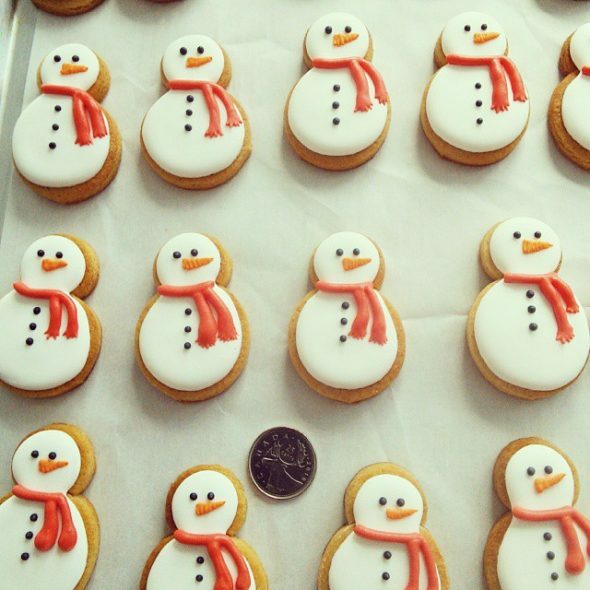 Decorating these guys is easy and great for beginners! A close up of the penguin might be helpful too. (Update: I’ve created a how-to video on decorating these here). 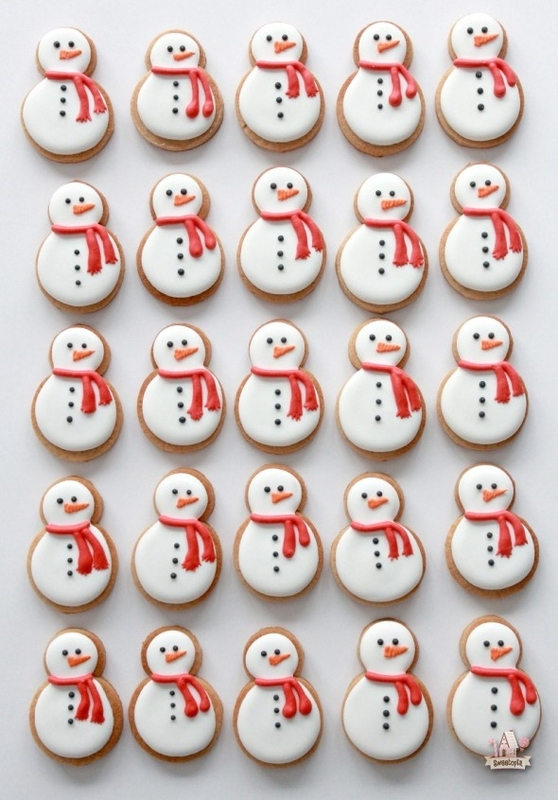 Such a simple recipe to make and the perfect palette for sweet cookie designs – have fun making them too! On low speed, mix peanut butter, butter and both sugars in the bowl of an electric mixer fitted with a paddle attachment, until incorporated. On low speed, add eggs and vanilla and mix until just combined. Sift salt and flour together and add to the mixture, stirring on low speed. (Tip - Before you mix, cover your bowl losely with a large tea towel, ensuring the tea towel does not get pulled into the machine, to trap the flour inside and prevent spilling). Mix until the dough collects around the paddle attachment. Roll your dough between two sheets of parchment paper and chill in the fridge for at least one hour. 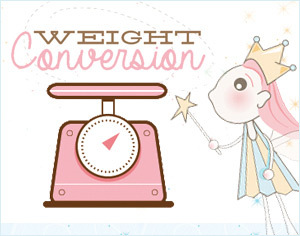 For a post on cookie thickness, see here. 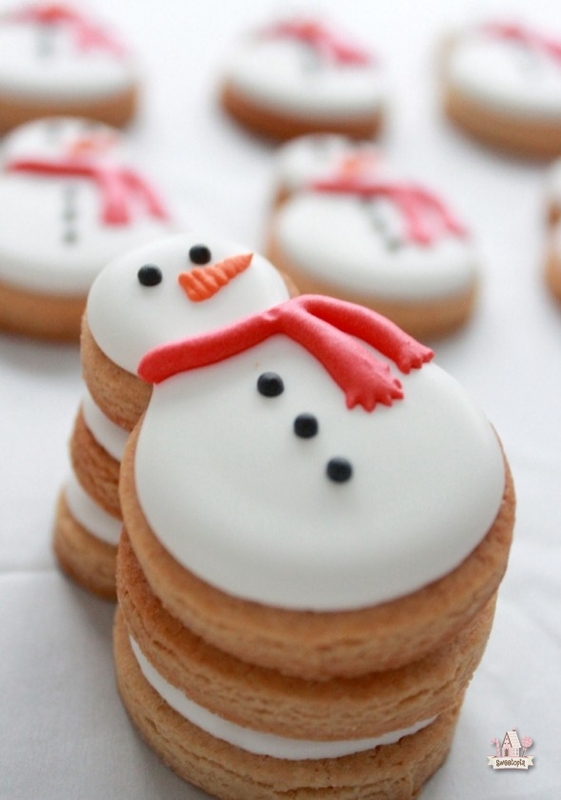 Cut your cookie shapes out and re-roll as needed. Note that shapes which are re-rolled tend not to keep their shape as well, even if you follow all the correct steps. 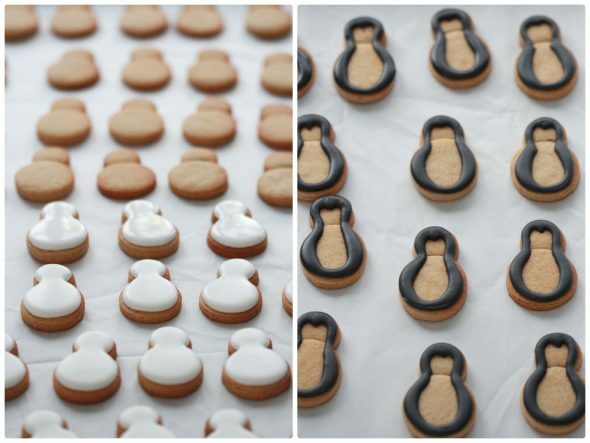 Keep your cookie shapes with most detail for the first round of cutting. 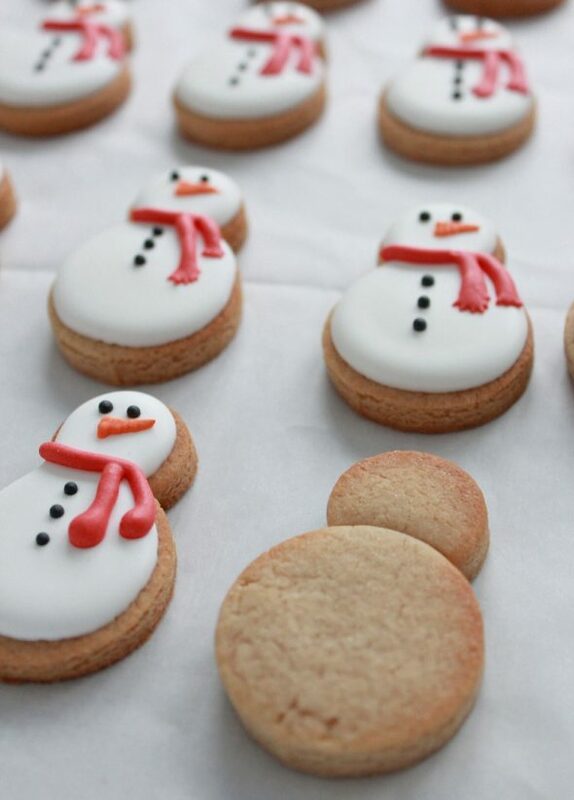 Place cookie shapes at least 1/2 an inch or 1 cm apart on a baking sheet lined with parchment paper. 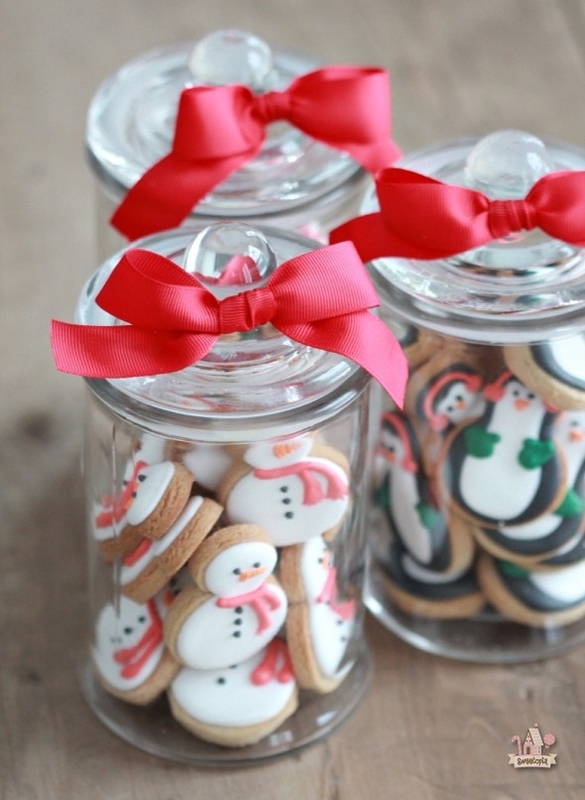 Place tray(s) of cookies in a fridge or freezer until thoroughly chilled; at least one hour. Bake at 350 degrees Fahrenheit for approximately 8-12 minutes. Larger shapes will need more time and smaller shapes less. Look for slightly golden brown edges. 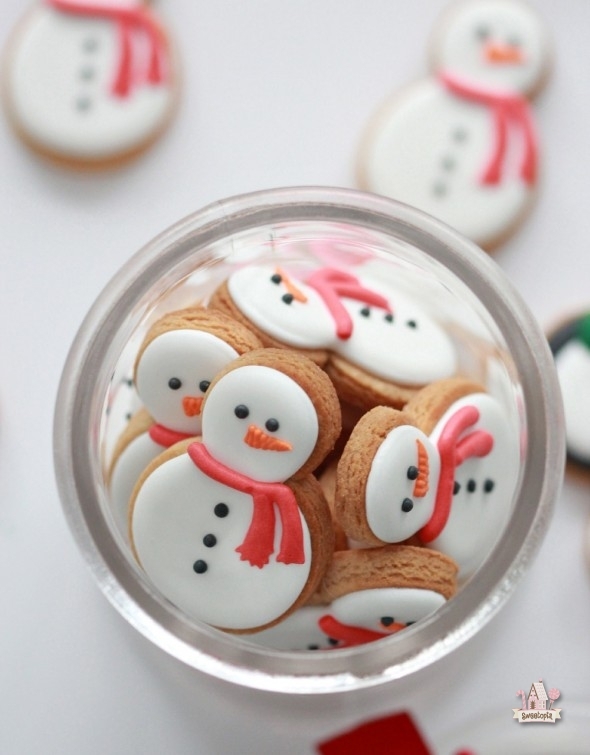 Once cookies have cooled, decorate as desired! p.s. I love Instagram! Are you on there and do you enjoy it as well? I’m @sweetopia_ if you’d like to follow me there. 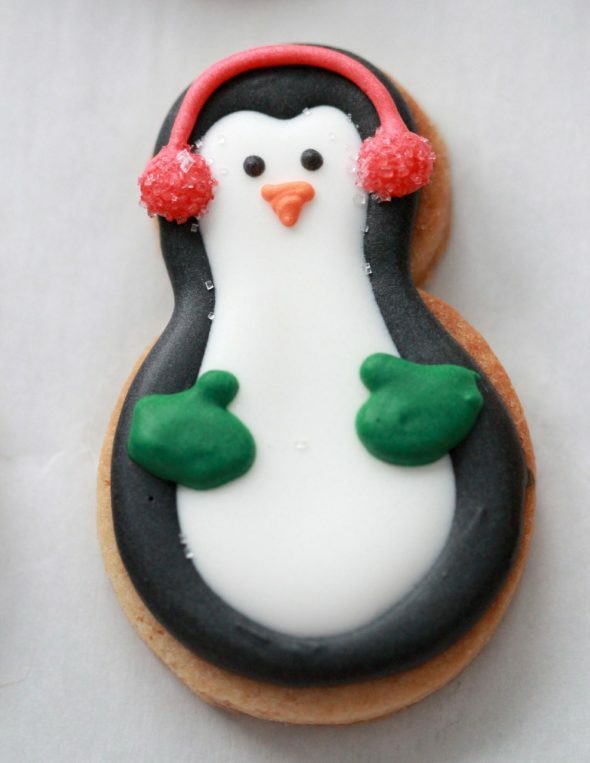 Hi, what can I do if my icing is too thick and therefore I cannot get the surfaces to smooth out? I made these… and then I immediately made them again! They are fantastic!! The recipe was so easy, and the cookies didn’t spread at all. Plus they are sooo delicious. This was also my first time ever trying royal icing. I loved it and they turned out so cute. Time consuming, but not nearly as difficult as I expected. Your site is a fantastic resource. Thank you so much for the recipes and tutorials! I just made a double batch of these cookies. THEY REALLY ARE FANTASTIC! I divided the double batch and cut up ghiradelli semi sweet chocolate bars and added about 1 1/2 cups of the chocolate chunks to one of the batches. Both the plain and chocolate chunk cookies are wonderful. My husband does not like peanut butter cookies, but he LOVED these. He said the peanut butter was not overpowering. His favorite were the peanut butter with chocolate chunks. Thanks for a FANTASTIC recipe! P.S. I cut up chocolate bars instead of using mini chips because I can’t find a good quality mini chocolate chip. The chunks lay flat, so they don’t disfigure the cookie shapes too much when I decorate them. Hi! What did I do wrong if my dough is too crumbly? No baking soda and/or baking powder? My dough was crumbling too. What do I do, cut down the flour? Hi Sharon, Ann Clark’s recipe says to add up to 1 tablespoon heavy cream if the dough is dry. I made this recipe today in the shape of dog bones for my sisters party. They are really good! I made half a batch and had plenty since the cutters were so small. I put mine in the freezer for 30 instead of the fridge for an hour and it turned out well. I definitely recommend trying these! How did you attach the two circles? Did you use a knife to cut a curve out of the smaller cookie or did you just smush them together? I just placed them together and slightly pressed them together. They bake together!